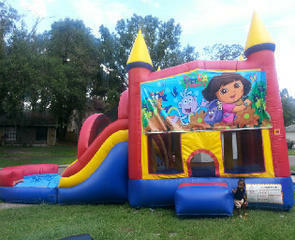 5IN1 Dora Bounce House Combo in Tampa. This Dora Theme Bounce House can be used dry for $175. The inside bounce house has obstacle poles, a BASKETBALL hoop, and rock climb. The shaded slide leads down into a pool of water if rented wet or inflated cushioned area if used dry. This bounce house combo is guaranteed fun for your party. This bounce house rental in Tampa can be delivered at any of these surrounding areas bounce house Brandon FL, new tampa, lutz, wesley chapel, riverview, Plant City, Bloomingdale and ALL of hillsborough county.